Most people experience back pain at some point during their adult life. In fact, it is one of the most common reasons people visit their doctor. Fortunately, though, the majority of back pain can be treated at home with time and simple home remedies or over-the-counter medications. One home remedy that has been used for centuries is Epsom salt. Originally discovered bubbling up in the waters of Epsom, England, this town became a spa destination as people came to soak in the waters to relieve muscle and back pain. Today, athletes and many others soak in Epsom salt baths to ease a variety of aches and pains, including back pain. Although Epsom salt can look like ordinary table salt, the chemical composition of this mineral is quite different. Also called magnesium sulfate heptahydrate, it’s composed of sulfate and magnesium, two minerals that have therapeutic effects for your body when ingested or absorbed through the skin. Because of this, Epsom salt has been used to treat constipation, itching, insomnia and, of course, back and muscle pain. Our bodies use magnesium to regulate a number of different bodily activities, and it’s also useful for reducing inflammation, helping with nerve and muscle function and preventing the hardening of arteries. Sulfates help your body absorb nutrients, flush toxins and can even be used to relieve migraine headaches. 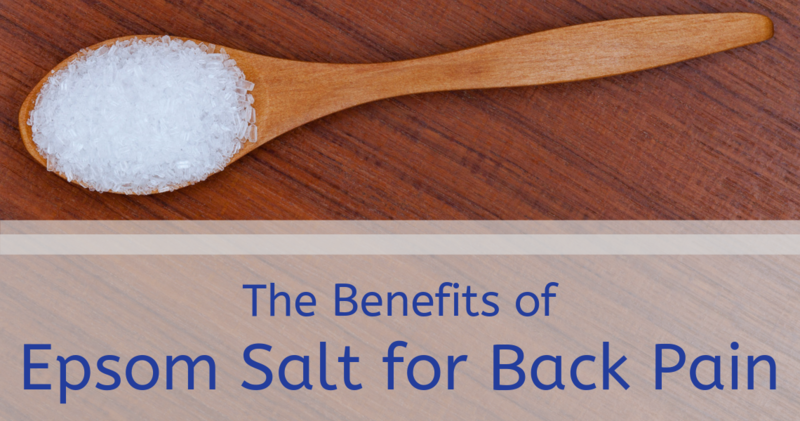 How Does Epsom Salt Relieve Back Pain? Reduces Swelling/Inflammation: Many people experience back pain due to inflammation in the muscles, which could be caused by an injury, a medical condition or overexertion during a workout. Epsom salt reportedly reduces inflammation, thus relieving this painful side effect. Relaxes Muscles: Tense muscles can be caused by a variety of conditions and may even be due to stress. When muscles are tense, this tends to exacerbate back pain. Epsom salt baths can ease and relax muscle tension. Balances Electrolytes: Some report back pain as one of the side effects of an electrolyte imbalance. Taking an Epsom salt solution can help balance electrolyte levels, offering a healthier alternative to sugary sports drinks. Run a warm bath, making sure the water is comfortable to the touch and not too hot. Add Epsom salt to your bath while the water is running to help it dissolve. There is usually a suggested amount on the package — generally one to two cups. Fully submerge the area of your back experiencing pain in the water for at least 12 minutes, and relax and enjoy your bath. No matter the cause of your painful symptoms, International Spine Institute specializes in the treatment of back pain. If you’ve been experiencing back pain for more than a few weeks without relief, then it’s time to give us a call. We can discuss conservative treatments and minimally invasive procedures that keep your recovery time short. Our compassionate and caring team is ready and waiting to help, so contact us today to make an appointment.